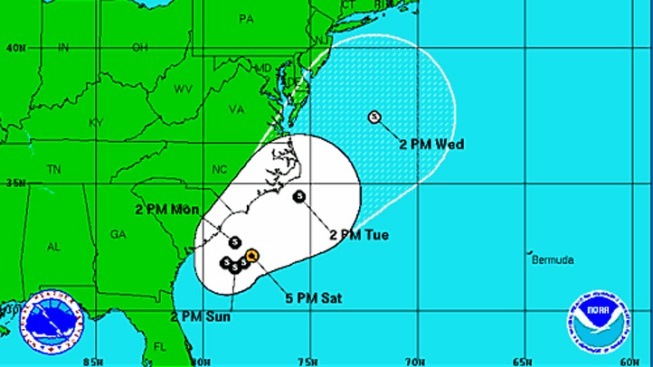 The first Tropical Storm of the 2012 Atlantic Hurricane Season was named Saturday afternoon. The season itself does not officially begin until June 1. On Saturday, the storm was positioned just off the coast of South Carolina, about 140 miles from Charleston. It is expected to gradually move towards the southwest through the weekend, then eventually shift towards the north/northeast Monday. Alberto is a weak tropical storm with maximum sustained winds around 45 mph. The current forecast maintains tropical storm status through early next week. The storm does not pose a threat to the coast. See the National Weather Service's forecast track here. This hurricane season changes will come to the dreaded forecast cone. For NBC 6's interactive radar, click here.